Can Goodwill help me find a job? We can! Goodwill is committed to helping people find meaningful work. For more information on the many programs Goodwill provides, visit our Help for the Job Seeker page. Where can I find help on my job search? 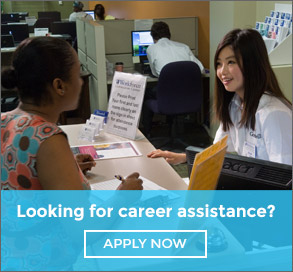 Goodwill Workforce Connection Centers offer free services to anyone in the community looking for job search and employment related assistance. You will have access to resume writing workshops, on-site interviewing and technology including computer, internet access, phones and fax machines. Find a Workforce Connection Center near you on the Workforce Connection Center page. Does Goodwill provide assistance to employers looking for employees? Yes. You can find the help you need under the Employer Resource button. Can you tell me about job opportunities at Goodwill? We offer a diverse mix of professional, managerial and entry-level opportunities in retail sales, food service, human services, light manufacturing, administrative support and other areas. We offer competitive wages and a benefits package. Please visit our Careers at Goodwill section and click on the Apply Now button. How can I make a financial contribution to Goodwill? Please visit our How You Can Help section where we list all the different ways and types of giving offered by Goodwill. Where can I bring my donations? For a list of our Store & Donation Centers, click on the Store Locator at the top of the page. We have convenient, drive up donation centers with friendly staff to help you. Where can I find retail donation guidelines and values of my donations? You can find our retail donation guidelines and values on our amazinggoodwill.com website. Just click on the Donating link once you reach the amazing website. Can I donate my vehicle to Goodwill? Yes. Goodwill accepts all vehicles in any condition. The donation process is quick and easy, and vehicle donations are tax deductible. Simply fill out our Online Donation Form. We will arrange for a tow truck to pick up your vehicle within 24-48 hours. Where are the Goodwill Stores located? Just click on the Store Locator at the top of the page and enter your zip code and it will bring up a list of the Goodwill Store & Donation Centers nearest you. How old do I need to be to volunteer at Goodwill? Volunteers must be 14 years of age or older. For more information and volunteer opportunities visit our How You Can Help section and click on Volunteer. Does Goodwill provide commercial laundry services? Yes. Please visit our Goodwill Laundry & Linen services website for details: goodwilllaundry.com. Does Goodwill provide secure document destruction services? Yes. Please visit our Goodwill DataShield website at goodwilldatashield.com or call us for more information. Does Goodwill offer packaging and assembly services? Yes. We offer several different services at Goodwill Manufacturing. Please visit our website at goodwillmanufacturing.com or call us at for more information.